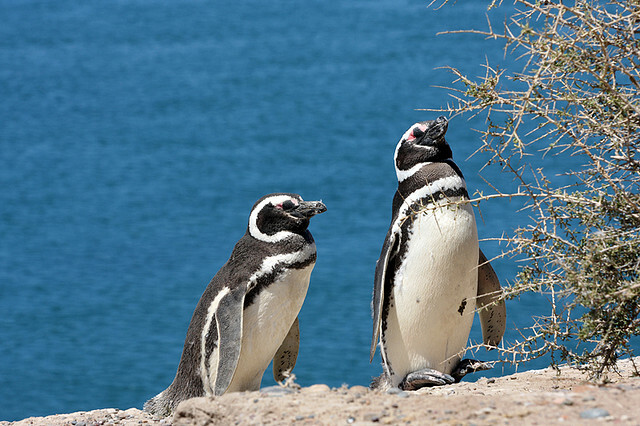 The Galapagos Penguin as its name implies, is native from the Galapagos Islands. This animal remains all the year in waters close to the archipelago; it lives mainly in the Fernandina, Isabela, Floreana, Bartolomé and Santiago Islands and in another smaller islands. This particular animal is not a very big one. Their dimensions are: their length reaches up to 53 cm (1,74 feet) , they have an average weight of 2.2 Kg (4,8 punds). They have a thin white band from the eye to the jaw. These penguins have a black head and a black band running in inverted form to the figure of a boot around their stomachs that extends to its feet. The female penguins are smaller than males, but have a similar structure. Galapagos penguins are similar to those of the variety Magellanic penguins except that the black band on the Galapagos Islands is thinner and smaller. Penguins in the Galapagos Islands were brought by the Humboldt current, which is composed of cold water and nutrients from the Antarctica. Another native animal in Galapagos are the Galapagos Tortoise. The Galapagos penguin nests between rocks or in small caves. The clutch consists of two eggs, which are incubated for about 40 days. The breeding season lasts all year and it is possible that a couple nest twice in a year. Their feeding is based on fish and shellfish,that they get while swimming. One of the methods used by them is fishing in groups of their own species. Usually these groups have about 50 individuals, but studies shows that they have been fishing together up to 200 of them. Galapagos Penguins often enter the water to cool off from the hot sun of Ecuador and swim in a very funny and slowly with their heads above water. But when they are searching for food they can dive into the water using their wings and legs to gain speed. In many cases they look for food near the shore and feed largely on small fish such as sardines that are caught as they swim and dive into the ocean. Penguins feed only during the day and depend on the nutrients in the cold currents as Humboldt because it brings lots of fish for food. 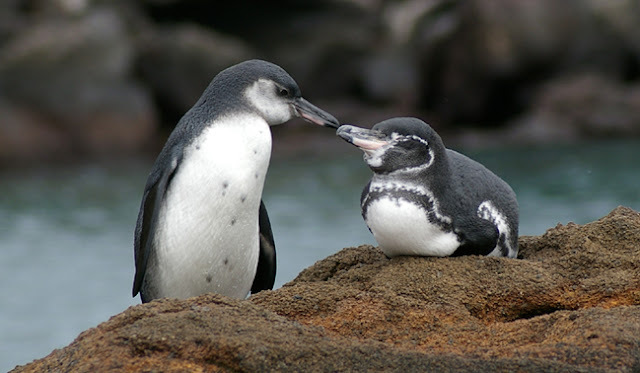 The Galapagos penguin, endemic to the archipelago, is the species of penguin that lives north of the world. Most of its population is on the rocky coast of Fernandina and Isabela islands. It is incredibly aerodynamic animal , it can reach a speed of 35 km per hour, nearly twenty times faster than a human. The Galapagos penguin is a very rare species with a population of less than 2,000. Reproduction of this penguin is very closely linked with the environment and it is for this reason that climate change is a serious threat to their future.